It's like the Serengeti in Africa, but you have whales instead! 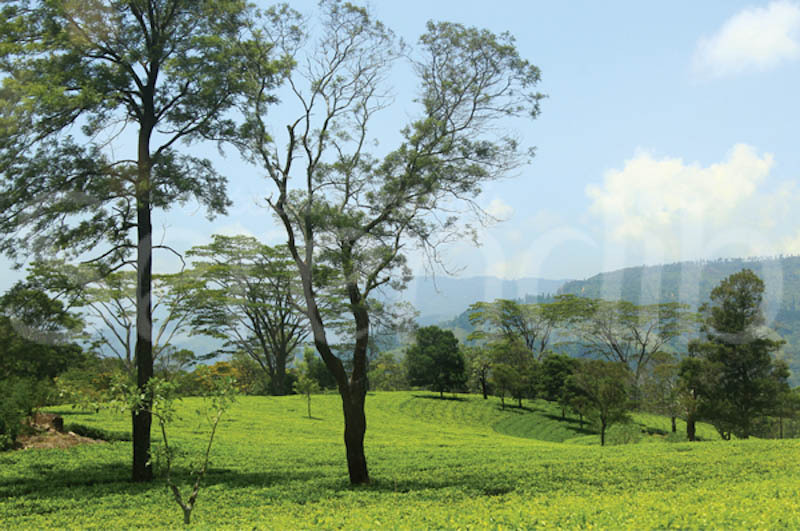 Loolecondera is no ordinary plantation, for it was here that James Taylor made the first successful attempt to grow and process tea in Ceylon. 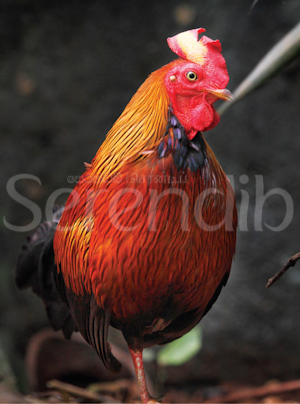 Sri Lanka's magnificent national bird, the Ceylon Junglefowl, has a reputation for resilience. 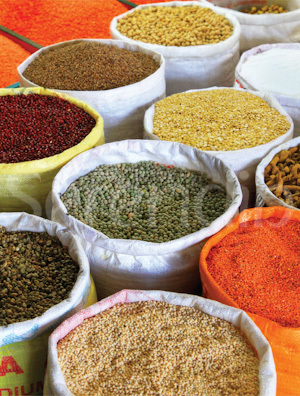 Steaming bowls of legumes such as kadala, mung eta, cowpea and dhal are a common sight on Sri Lankan tables. Shaded by numerous trees and cooled by the soft breeze that rustled by, I gazed around, transfixed by the breadth of the ancient monastic ruins that encircled the periphery. 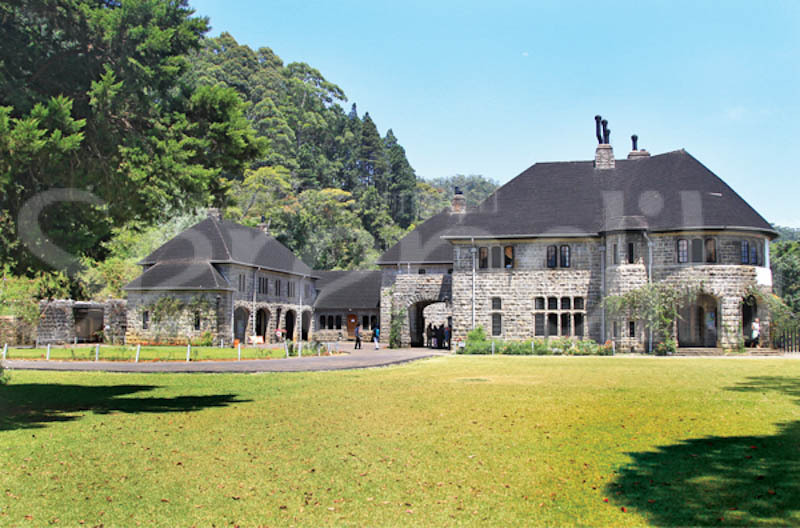 Although Sri Lanka has scores of colonial tea plantation bungalows and some â€¨grand heritage hotels, it has only one stately home: Adisham. Shaded by numerous trees and cooled by the soft breeze that rustled by, I gazed around, transfixed by the breadth of the ancient monastic ruins that encircled the periphery. 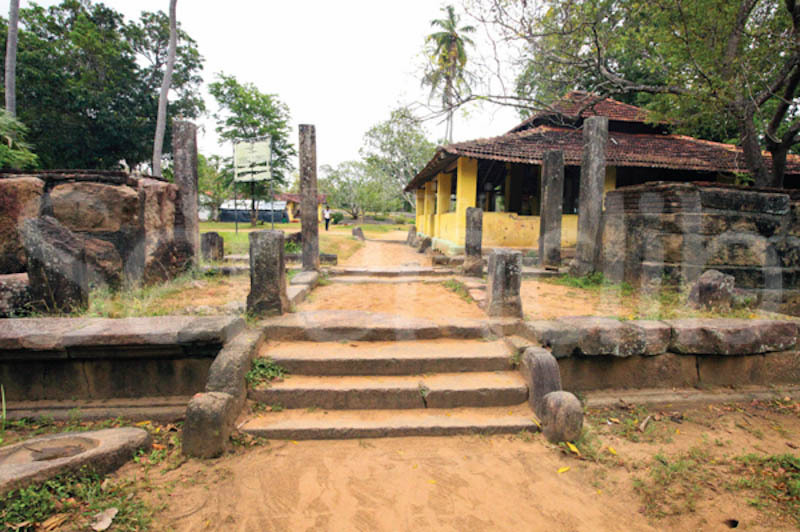 Treading softly, I stepped through the entrance of Magul Maha Viharaya of Lahugala trying to trace the beauty and the chronicles of a bygone era. Stepping onto a narrow gravel path lined with overgrown shrubs, we made our way climbing over a small rock formation and passing a few modern buildings, finally alighting on some steps and balustrades (Korawak Gal) carved out of stone. Hastening through these and the Northern Entrance of the Magul Maha Viharaya, we caught our first glimpse. 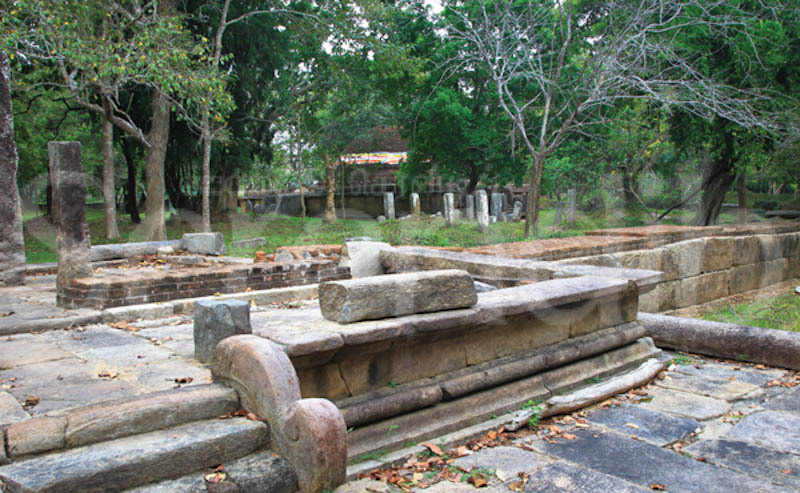 The Magul Maha Viharaya is believed to be a temple complex with a vibrant history dating back to the times of King Kavantissa (205-161 BC) who ruled the Ruhuna Kingdom. 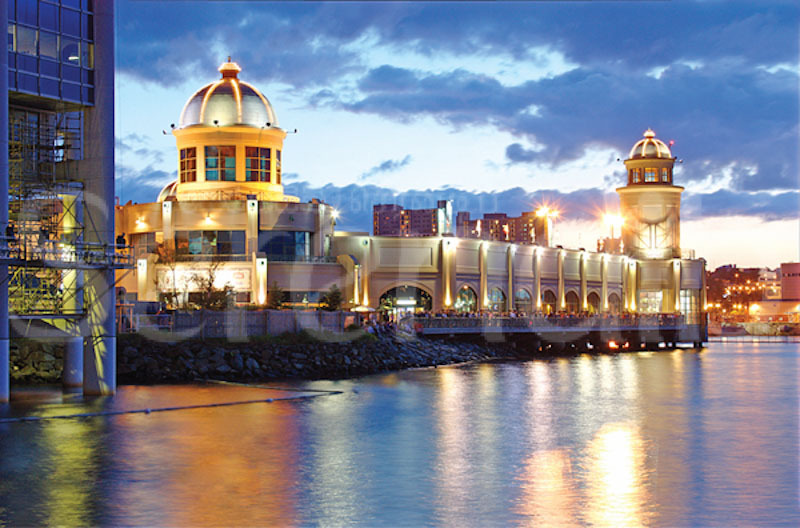 However, varying sources claim that King Dhatusena (463-479 AD) built the complex while various other Monarchs renovated it through the centuries. From all the legends that surround the Viharaya, the most arresting is the story of King Kavantissa and Princess Viharamaha Devi. According to legend Viharamaha Devi, daughter of King Kelanitissa volunteered to sacrifice herself to the sea to appease the gods who were enraged at the King for punishing an innocent monk. 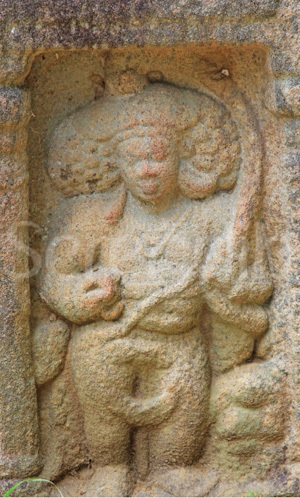 â€¨The princess was safely carried over â€¨the ocean waves, reaching ashore at a place near the Viharaya where the encounter between King Kavantissa â€¨and the princess led to their marriage. The legend tells that the marriage ceremony was conducted on the grounds of the Magul Maha Viharaya where the King had later built the Temple to celebrate the auspicious event. Thus rendering the name ‘Magul Maha Viharaya': the word Magul itself conveys the meaning of foremost or auspicious. Nevertheless, it is clear that the Temple complex has been renovated by several monarchs. 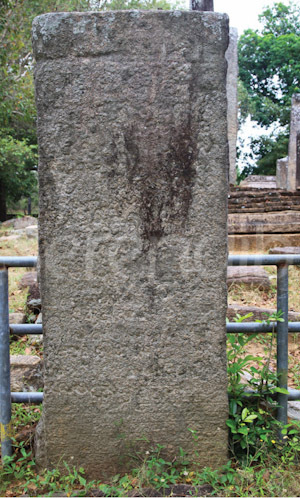 A stone inscription, believed to date back to the 14th Century, located within the complex grounds tells of a queen also of the name Viharamaha Devi, wife of King Buvenekabahu IV of Gampola and Parakramabahu V of Dedigama, who renovated and donated many acres and here the Temple is inscribed as Ruhunu Maha Viharaya. Some other sources speak of a king named Dappula I (661-664 AD), who built and donated the Temple after listening to the preachings of monks. The unearthed ruins of the Temple complex seem small though significant, when compared to the designated breadth, which covers an area of about 200 acres. It is surmised that around 12,000 monks inhabited the complex at one point, which explains the enormity of the complex. As we traversed the gravel path that led towards the ruins, we stopped at a large pond that was covered with debris. It is said that there were about seven such ponds in the olden days and that the ponds served as ablution sites for monks. 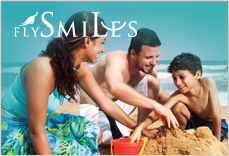 A small staircase made of stone led to the pond while some stone slabs lined the sides. Passing by, we arrived at the Northern Entrance of the Magul Maha Viharaya, where stone pillars and steps attested to the grand entrance that must have existed in more exuberant times. Proceeding to the left where the ruins of what is thought to be the Pohoya Seema Malakaya (Chapter House) stood, we stopped to inspect the moonstone, the carved stone â€¨steps and the balustrades that have been marvelously preserved. 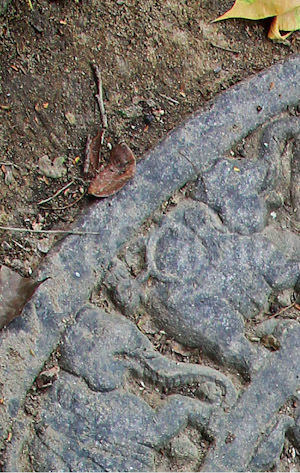 â€¨The moonstone engraved here is held in much prominence as this is the only one in Asia that has the mahout astride the elephant. 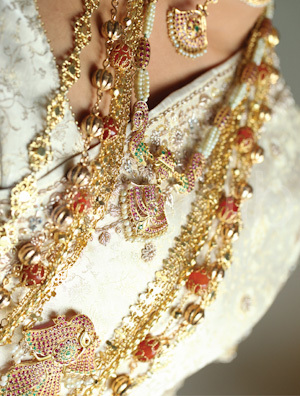 Comprising of many half circles engraved with designs such as liyavel; an intricate design incorporating vine like patterns, lotus petals and animals, the moonstone is deemed as a portrayal of the cycle of birth. Afterwards we ambled towards the ancient Stupa built atop a raised platform of six feet. Four stairwells lined with balustrades where carved lions sat at the peaks, led to the Stupa. Each entrance was also decorated with a pair of guard-stones (muragal) that has carved punkalas - pots of prosperity - or human figures. To the west of the Stupa is the much famed Bodhigara - the Bo Tree Shrine - known amongst people as the Magul Poruwa (marriage podium) of King Kavantissa and Queen Viharamaha Devi. It is believed that the Poruwa was later converted to a Bodhigara that housed the Bo Tree within the circular structure that is similar to a flower. 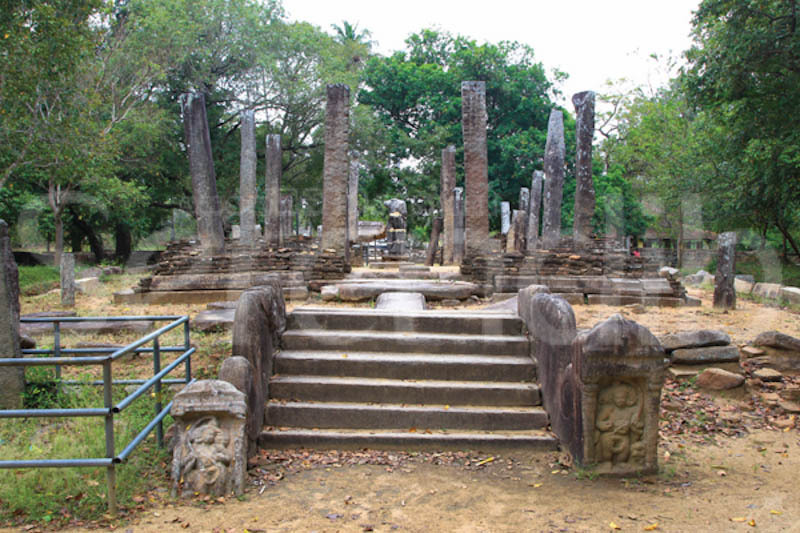 The surrounding platform has carvings, which are thought to be constructed during the middle of the Anuradhapura Era. Located to the right of the Northern Entrance is the Image House where we observed a stone inscription believed to be from the 14th Century. As with all entrances, the Image House also had balustrades, guard stones and moonstones equipped with distinctive carvings unfamiliar to my eyes when compared to others I have seen. 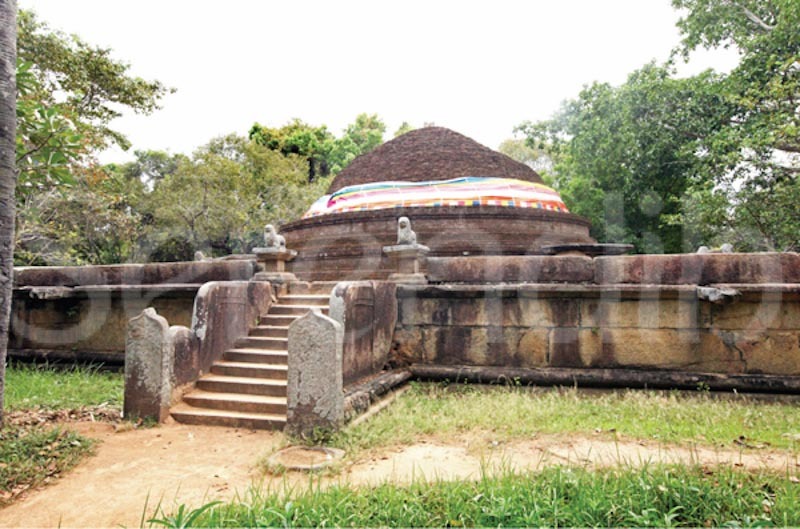 These are thought to date back to the Anuradhapura Era. 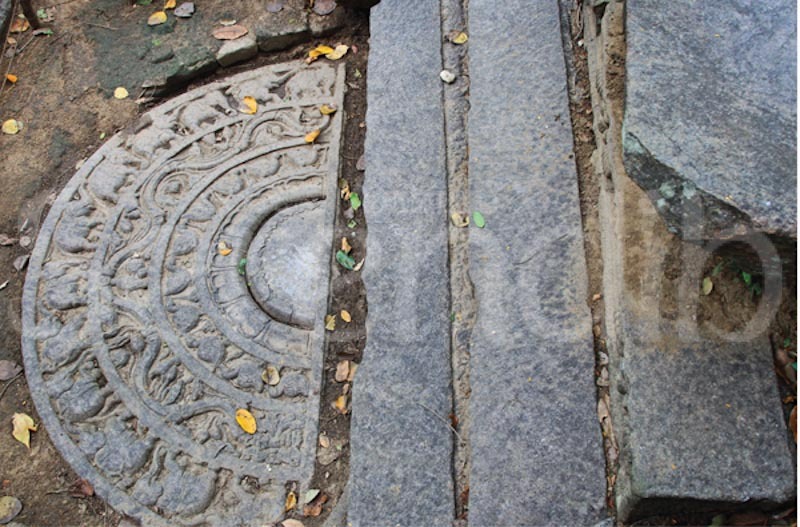 To enter the Image House we stepped through a stone slab with a pattern of liyavel running along the length, which showcased much similarity to a flower offering altar. Passing through the ruined stone pillars we came upon a Standing Statue of Lord Buddha made out of limestone standing gracefully amidst the ruins. Stepping onto the grass turf outside we let our gaze linger on other ruins - many stone pillars and other remnants of varying sizes deemed to belong to a Dham Sabha Mandapaya (a preaching hall) or a Dhathu Gruhaya (a house of relics) scattered across the area. Part of the ancient inner rampart located at the northern periphery showcased the dexterity of ancient craftsmen and the ruins of an outer rampart was faintly visible some metres away. It is believed that many buildings comprising of Sangarama (monasteries), Piriven (universities or seats of learning for monks) and other accommodations were built within the ramparts and even beyond. 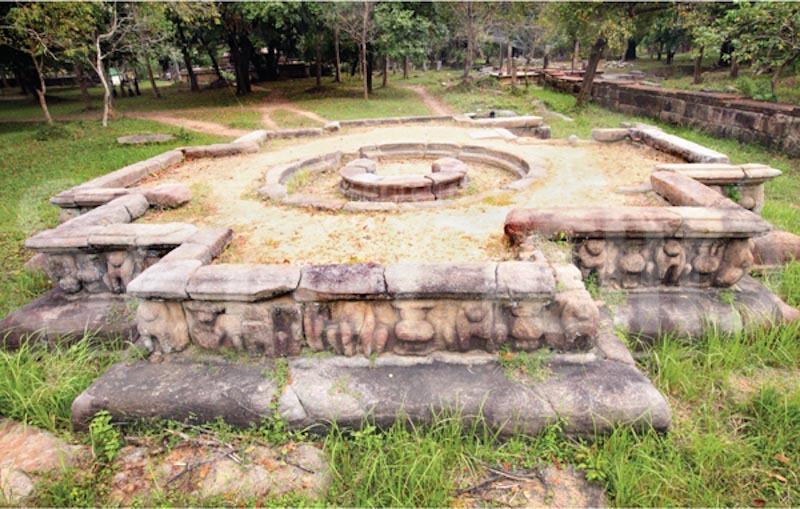 There is still much left to be discovered and explored in the vast expanse that encompasses the Magul Maha Viharaya. 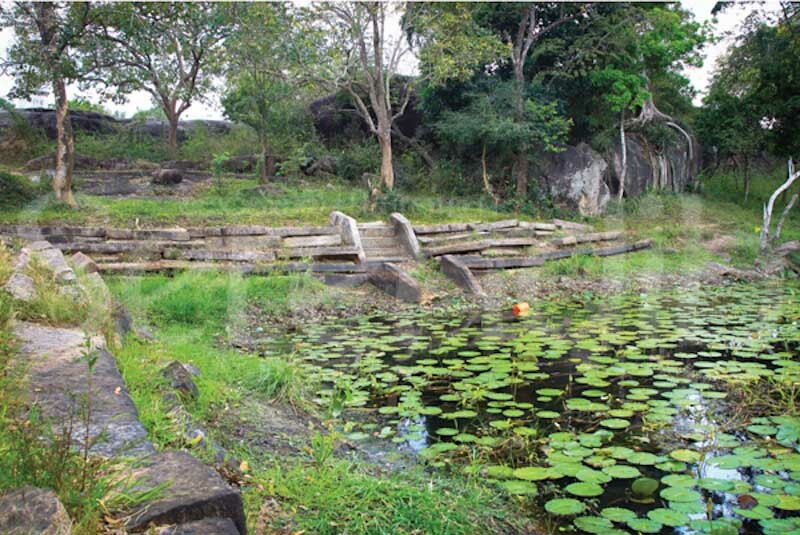 It is easy to see that only then will we be able to fully comprehend the secrets hidden deep within the ruins of this ancient abode that is a unique aspect of the Sri Lankan heritage.